After working in construction for 16 years, the last decade spent building big water features, Haider was looking to transition into another line of work. He was clear on little else than that he needed a change. Then clarity came in a flash when his wife Kristen alerted him to a television piece on Growing Power, an organization run by basketball star turned urban agriculture pioneer, Will Allen. Learning about Allen’s work with aquaponics led Haider to realize that in having tended an aquaponics system in his basement for years, he already had the makings of a second career. “I’m a fish geek,” says Haider. So Haberman, Haider, and real estate expert Chris Ames identified the long vacant Hamm’s Brewery as a suitable headquarters in 2011, and quickly set about acquiring it. The $300,000 purchase price was covered by a $150,000 grant from the City of St. Paul and additional funds were provided by a group of local and private investors. And indeed, Haider’s experience raising tilapia, tomatoes and lettuce with a 110-gallon aquarium and a two-by-four foot hydroponic system has proved critically important as Urban Organics embarks on its first phase of operation in a building that formerly housed a brewery. 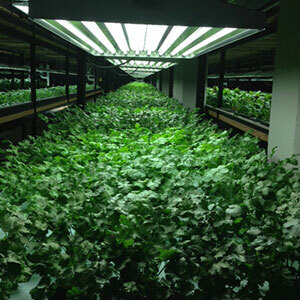 Currently, Urban Organics’ aquaponics system is up and running on one of the brick building’s six floors. As dictated by the business plan, all aspects of the production, distribution and consumption of the food produced by Urban Organics will be kept local. Rather than shipping their goods, Urban Organics will sell them through a local grocery chain of over a dozen stores. Haberman’s enthusiasm for what he describes as “making money while making good” has proven to be contagious. The company was approached by Fortune 500 company Pentair with a partnership offer. Pentair, also based in the Twin Cities, had recently expanded its services to include design, construction, maintenance and technical support for aquaculture markets, so partnering with Urban Organics represented an ideal opportunity. “To help showcase their products, Pentair provided us with state-of-the-art equipment. It was perfect timing, really helpful,” says Haberman. The delivery of fresh produce to market in February will represent an important benchmark for Urban Organics. With the profit gained, Haberman, Haider and Ames intend to expand the organization’s operations to fill all six floors of their facility. For now, due to the time they require to reach maturity, the tilapia raised serve little function beyond providing fertilizer to the crops. Haider’s fish ambitions however remain undampened; in the near future he plans to install a cold water system that will support trout and walleyes- and spinach. Haberman revels in day-to-day progress as he looks to the future of growing Urban Organics and energizing local entrepreneurs.